*No* disrespect to the guys who wrote it, but it doesn't work. Over the last several months I've been developing a product for my employer which uses a fast fourier transform as part of its functionality. The product is based upon a 17C44, by the way. I was foolish enough to plan my timescales assuming that the Microchip FFT would be pretty well "plug and play". After all, I do tend to trust the stuff they publish. How wrong I was! I won't bore you with the details, but Microchip's FFT is seriously defective. I can only guess that it didn't receive much testing. In fact, reading between the lines in AN542 it becomes clear that it was primarily written as a *benchmarking* exercise rather than a reliable FFT module for use in our projects. Basically, if you test it with the waveform shown in the AN, it works perfectly. I should have been suspicous, even so. The waveform shown is of very low frequency, and has a whole number of cycles in the sampling window. Alter that frequency by even a small amount, so that there isn't a whole number of cycles in the window and the whole thing goes haywire! It generates artefacts in the FFT output all over the place, both above and below the "real" frequency. Similarly, test it at higher frequencies with sine or square waves, and you get a complete spectrum of rubbish at the output. Incidentally, it wasn't made clear in the AN that permissible input range of values is between 0 and 3FFF. In other words, you need to DC-shift your sound sample so its centred around 1FFF, and adjust its gain. That caught us out for a couple of days! We assumed it must be something we were doing wrong and spent ages poring over the AN to see if we were doing something stupid. We also tried working through the code itself, but it is almost inpenetrable. We tried everything, including using very small amplitude signals, but to no avail. The output is rubbish *except* with very low frequency square waves with a whole number of cycles in the window. I can only imagine that there is a scaling problem somewhere in the maths. It looks like there is some sort of overflow or fold-back going on. This cost me two months of development time and made me very unpopular with my employer and customer! In the end we gave up and looked elsewhere. This is where Robert Lacoste comes into the picture. He developed his own FFT module from scratch and incorporated it into his PIC'Spectrum product. I contacted him and asked if he would be willing to let us use his FFT module - for prototyping and test purposes only - in our own product. He was willing and incredibly helpful, answering all our questions with clarity. It took us two days to unplug the Microchip FFT module and plug in the Lacoste module. Here's what happened. It worked PERFECTLY! The output is classic, text-book perfect under all circumstances. Furthermore, it runs at least ten times as fast as the Microchip module. Let me state publicly my most grateful thanks to Robert. If you need to include an FFT in any of your products, contact him on robert_lacoste@yahoo.fr He allowed us free use in our prototypes, and suggested a very reasonable royalty on our production models. I expect he might extend a similar deal to others. In summary, then: BEWARE the Microchip FFT, and THANK YOU Robert Lacoste! 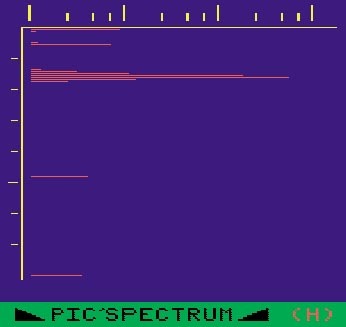 http://www.circuitcellar.com/library/print/0998/Lacoste98/index.htm PIC'Spectrum: A spectrum analyser with bit banged video display. ; standard VGA display, done entirely with a PIC17C756 microcontroler. ; of course in real time. ; will be done by the interrupt routine synchronously with video generation. ; Definition of all RAM variables, bank per bank. ; routine. Other locations are in bank 0.
; using FSR1 or table read registers ! ; 2 bits for the integer part, 13 bits for the decimal part). ; All functions and macros operate on registers ra,rb and rdiv. ; four blocks being at at fixed adress ($80 to $ff) in the 4 banks. tablrd 0,1,x0+1		; and low byte. tablrd 0,1,x1+1		; and low byte. tablrd 0,1,scaletmp+1	; and low byte. ; displayed if the Pic'Spectrum is switched on in hold mode. cpfseq test_halfp	; equal to half-period ? ; registers of the 17C756 (array DATA). ; (2 bytes per value, MSB first). ; real) are in data and data respectively. ; and, more important, 50% less RAM requirement. ; Power spectrum calculation starting with the result of the real FFT. ; two blocks being at at fixed adress ($20 to $5F) in the banks 2 and 3.
; Nota : dispbuf(0) (DC frequency) is not displayed. ;		to MAXPIXVAL) and store the result in "dispbuf"
; from misaligned pixels to... loss of video synchronisation. ; and "RT" comments) but I'm not sure that the list is complete ! ; modern compilers do as part as their optimization phase... loop unrolling ! ; Check if an analog acquisition is requested by the main program. ; is constant (=30 clock cycles) and its position fixed. movlw 2			; acq_request = 2 ? cpfseq acq_request	; acq_request=1 ? movfp tmpi, PCL		; and jump to it ! goto scan_sepline	; scan 104 (sl 042), frequencies sep.
goto scan_sepline	; scan 106 (sl 044), frequencies sep.
goto scan_sepline	; scan 108 (sl 046), frequencies sep.
goto scan_sepline	; scan 110 (sl 048), frequencies sep.
goto scan_sepline	; scan 112 (sl 050), frequencies sep.
goto scan_sepline	; scan 114 (sl 052), frequencies sep.
goto scan_sepline	; scan 116 (sl 054), frequencies sep.
goto scan_sepline	; scan 118 (sl 056), frequencies sep.
goto scan_sepline	; scan 120 (sl 058), frequencies sep.
goto scan_sepline	; scan 122 (sl 060), frequencies sep.
goto scan_sepline	; scan 124 (sl 062), frequencies sep.
goto scan_sepline	; scan 126 (sl 064), frequencies sep.
goto scan_sepline	; scan 128 (sl 066), frequencies sep.
goto scan_sepline	; scan 130 (sl 068), frequencies sep.
goto scan_sepline	; scan 132 (sl 070), frequencies sep.
goto scan_sepline	; scan 134 (sl 072), frequencies sep.
goto scan_vscaleshort	; scan 136 (sl 074), v.scale short s.
goto scan_sepline	; scan 138 (sl 076), frequencies sep.
goto scan_sepline	; scan 140 (sl 078), frequencies sep.
goto scan_sepline	; scan 142 (sl 080), frequencies sep.
goto scan_sepline	; scan 144 (sl 082), frequencies sep.
goto scan_sepline	; scan 146 (sl 084), frequencies sep.
goto scan_sepline	; scan 148 (sl 086), frequencies sep.
goto scan_sepline	; scan 150 (sl 088), frequencies sep.
goto scan_sepline	; scan 152 (sl 090), frequencies sep.
goto scan_sepline	; scan 154 (sl 092), frequencies sep.
goto scan_sepline	; scan 156 (sl 094), frequencies sep.
goto scan_sepline	; scan 158 (sl 096), frequencies sep.
goto scan_sepline	; scan 160 (sl 098), frequencies sep.
goto scan_sepline	; scan 162 (sl 100), frequencies sep.
goto scan_sepline	; scan 164 (sl 102), frequencies sep.
goto scan_sepline	; scan 166 (sl 104), frequencies sep.
goto scan_vscaleshort	; scan 168 (sl 106), v.scale short s.
goto scan_sepline	; scan 170 (sl 108), frequencies sep.
goto scan_sepline	; scan 172 (sl 110), frequencies sep.
goto scan_sepline	; scan 174 (sl 112), frequencies sep.
goto scan_sepline	; scan 176 (sl 114), frequencies sep.
goto scan_sepline	; scan 178 (sl 116), frequencies sep.
goto scan_sepline	; scan 180 (sl 118), frequencies sep.
goto scan_sepline	; scan 182 (sl 120), frequencies sep.
goto scan_sepline	; scan 184 (sl 122), frequencies sep.
goto scan_sepline	; scan 186 (sl 124), frequencies sep.
goto scan_sepline	; scan 188 (sl 126), frequencies sep.
goto scan_sepline	; scan 190 (sl 128), frequencies sep.
goto scan_sepline	; scan 192 (sl 130), frequencies sep.
goto scan_sepline	; scan 194 (sl 132), frequencies sep.
goto scan_sepline	; scan 196 (sl 134), frequencies sep.
goto scan_sepline	; scan 198 (sl 136), frequencies sep.
goto scan_vscaleshort	; scan 200 (sl 138), v.scale short s.
goto scan_sepline	; scan 202 (sl 140), frequencies sep.
goto scan_sepline	; scan 204 (sl 142), frequencies sep.
goto scan_sepline	; scan 206 (sl 144), frequencies sep.
goto scan_sepline	; scan 208 (sl 146), frequencies sep.
goto scan_sepline	; scan 210 (sl 148), frequencies sep.
goto scan_sepline	; scan 212 (sl 150), frequencies sep.
goto scan_sepline	; scan 214 (sl 152), frequencies sep.
goto scan_sepline	; scan 216 (sl 154), frequencies sep.
goto scan_sepline	; scan 218 (sl 156), frequencies sep.
goto scan_sepline	; scan 220 (sl 158), frequencies sep.
goto scan_sepline	; scan 222 (sl 160), frequencies sep.
goto scan_sepline	; scan 224 (sl 162), frequencies sep.
goto scan_sepline	; scan 226 (sl 164), frequencies sep.
goto scan_sepline	; scan 228 (sl 166), frequencies sep.
goto scan_sepline	; scan 230 (sl 168), frequencies sep.
goto scan_vscaleshort	; scan 232 (sl 170), v.scale short s.
goto scan_sepline	; scan 234 (sl 172), frequencies sep.
goto scan_sepline	; scan 236 (sl 174), frequencies sep.
goto scan_sepline	; scan 238 (sl 176), frequencies sep.
goto scan_sepline	; scan 240 (sl 178), frequencies sep.
goto scan_sepline	; scan 242 (sl 180), frequencies sep.
goto scan_sepline	; scan 244 (sl 182), frequencies sep.
goto scan_sepline	; scan 246 (sl 184), frequencies sep.
goto scan_sepline	; scan 248 (sl 186), frequencies sep.
goto scan_sepline	; scan 250 (sl 188), frequencies sep.
goto scan_sepline	; scan 252 (sl 190), frequencies sep.
goto scan_sepline	; scan 254 (sl 192), frequencies sep.
goto scan_sepline	; scan 256 (sl 194), frequencies sep.
goto scan_sepline	; scan 258 (sl 196), frequencies sep.
goto scan_sepline	; scan 260 (sl 198), frequencies sep.
goto scan_sepline	; scan 262 (sl 200), frequencies sep.
goto scan_vscalelong	; scan 264 (sl 202), v.scale long s.
goto scan_sepline	; scan 266 (sl 204), frequencies sep.
goto scan_sepline	; scan 268 (sl 206), frequencies sep.
goto scan_sepline	; scan 270 (sl 208), frequencies sep.
goto scan_sepline	; scan 272 (sl 210), frequencies sep.
goto scan_sepline	; scan 274 (sl 212), frequencies sep.
goto scan_sepline	; scan 276 (sl 214), frequencies sep.
goto scan_sepline	; scan 278 (sl 216), frequencies sep.
goto scan_sepline	; scan 280 (sl 218), frequencies sep.
goto scan_sepline	; scan 282 (sl 220), frequencies sep.
goto scan_sepline	; scan 284 (sl 222), frequencies sep.
goto scan_sepline	; scan 286 (sl 224), frequencies sep.
goto scan_sepline	; scan 288 (sl 226), frequencies sep.
goto scan_sepline	; scan 290 (sl 228), frequencies sep.
goto scan_sepline	; scan 292 (sl 230), frequencies sep.
goto scan_sepline	; scan 294 (sl 232), frequencies sep.
goto scan_vscaleshort	; scan 296 (sl 234), v.scale short s.
goto scan_sepline	; scan 298 (sl 236), frequencies sep.
goto scan_sepline	; scan 300 (sl 238), frequencies sep.
goto scan_sepline	; scan 302 (sl 240), frequencies sep.
goto scan_sepline	; scan 304 (sl 242), frequencies sep.
goto scan_sepline	; scan 306 (sl 244), frequencies sep.
goto scan_sepline	; scan 308 (sl 246), frequencies sep.
goto scan_sepline	; scan 310 (sl 248), frequencies sep.
goto scan_sepline	; scan 312 (sl 250), frequencies sep.
goto scan_sepline	; scan 314 (sl 252), frequencies sep.
goto scan_sepline	; scan 316 (sl 254), frequencies sep.
goto scan_sepline	; scan 318 (sl 256), frequencies sep.
goto scan_sepline	; scan 320 (sl 258), frequencies sep.
goto scan_sepline	; scan 322 (sl 260), frequencies sep.
goto scan_sepline	; scan 324 (sl 262), frequencies sep.
goto scan_sepline	; scan 326 (sl 264), frequencies sep.
goto scan_vscaleshort	; scan 328 (sl 266), v.scale short s.
goto scan_sepline	; scan 330 (sl 268), frequencies sep.
goto scan_sepline	; scan 332 (sl 270), frequencies sep.
goto scan_sepline	; scan 334 (sl 272), frequencies sep.
goto scan_sepline	; scan 336 (sl 274), frequencies sep.
goto scan_sepline	; scan 338 (sl 276), frequencies sep.
goto scan_sepline	; scan 340 (sl 278), frequencies sep.
goto scan_sepline	; scan 342 (sl 280), frequencies sep.
goto scan_sepline	; scan 344 (sl 282), frequencies sep.
goto scan_sepline	; scan 346 (sl 284), frequencies sep.
goto scan_sepline	; scan 348 (sl 286), frequencies sep.
goto scan_sepline	; scan 350 (sl 288), frequencies sep.
goto scan_sepline	; scan 352 (sl 290), frequencies sep.
goto scan_sepline	; scan 354 (sl 292), frequencies sep.
goto scan_sepline	; scan 356 (sl 294), frequencies sep.
goto scan_sepline	; scan 358 (sl 296), frequencies sep.
scan_blanking	goto resume_irq		; Nothing to do as video already off ! nop			; precalculated nop in this list ! ; the one for frequency lines ! btfsc PORTB,7		; log mode ? btfsc PORTB,6			;mode hold ? Regarding the comments about AN542 it sounds to me as if the apnote simply lacked a 'window', and was doing exactly what a 'by the book' FFT should do. In an exercise once I was required to simulate a wien bridge and investigate the output purity, the software was also very sensitive to whether an integer number of cycles were processed. I was suprised at this as it was the evaluation version of a professional CAD package.